Hopefully you are aware about the most popular cryptocurrency Bitcoin. But when we talk about this we also come across a term called Bitcoin Mining. 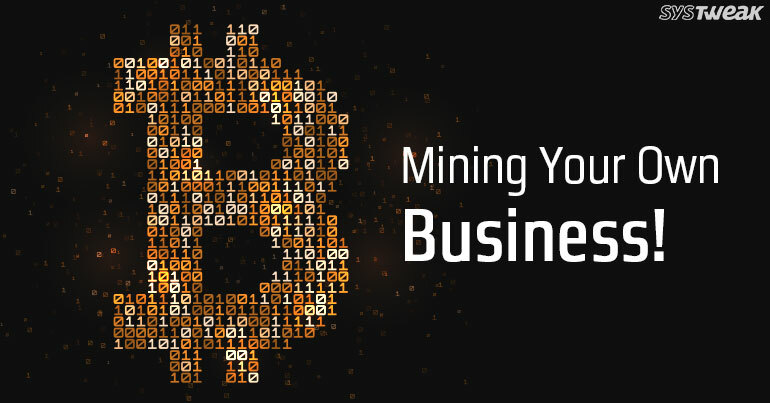 In this article let us find out what is Bitcoin Mining and how you can Mine a Bitcoin. Basically, there are three ways to obtain a Bitcoin. To purchase it from the sellers. To accept payment in the forms of Bitcoins. The third method may sound the easiest method but what is it how easy it is to mine a Bitcoin lets us find out. Bitcoins are not printed like the traditional currency in the world but are Mined from your computer itself. A computer running a mining program can generate Bitcoin because these computers are used to verify Bitcoin transactions to avoid frauds. This is how Miners ensure faster and safer transactions and for their hard work on many of such transactions they can mine a Bitcoin. Like other natural resources Number of Bitcoins which can be mined is limited. Total number of Bitcoins can ever be mined is 21 million. Here is how you can mine a Bitcoin for yourself. As we have told earlier in this article Miners have computers to verify Bitcoin transactions. So, the first step to become a Miner is to have a computer with GPU. Well you can use any computer but it may have more power consumption and which can make your returns zero. There is a custom hardware available in the market specific for the mining purpose. Some popular Bitcoin Mining hardware brands are Butterfly Labs, Coin terra and Bitcoin ultra. This hardware gives you better processing drawing less amount of power. After getting ready with the hardware you will need a Bitcoin wallet to accept the payment in terms of Bitcoins. You can choose from the local or online Bitcoin wallets. While choosing a Bitcoin wallet you should check the security of the wallet. Being a Miner, you can work with other miners in the pool or you can work alone. If you will work in the pool you will get quicker returns. If you are mining alone you will get lesser returns because of the competition. So, it is better to work in a pool while joining the pool you need to create yourself as a “Worker”. Pool charges a small fee from your earnings. Next thing you need to do is to have a mining program these programs are available for free. There are different mining programs available you can choose any depending on the hardware you are using. Mining programs need a batch file if you are connecting to pool. If you are mining individually then you should connect your wallet to the mining program. If you are having a Pool account then what you have earned will be transferred to pool and you can link your user account with the pool. Final step is to run the miner once you are done with the wallet integration and the program set up. This will start mining process but one thing you should take care that temperature of your CPU should not go high while you are mining because it may result in turning off the Machine. This is how you can have a Bitcoin without purchasing it. So, what are you waiting for start mining now before it will exhaust like other natural resources.